Nothing says the Fourth of July like a hot day in the sun with a big ‘ole slice of watermelon. It’s one of those fruits that single people don’t really buy unnecessarily because it’s an awful lot of fruit to eat alone. Thus, it has gone in to my unofficial list of “party foods”, or things that somehow seem too outlandish and decadent to buy without an event in mind. Prosciutto, more than one block of cheese, smoked salmon, and any of the flowers that don’t come in the $4 bucket… But don’t you worry, the Fourth of July is here and it’s time to buy all of the things. 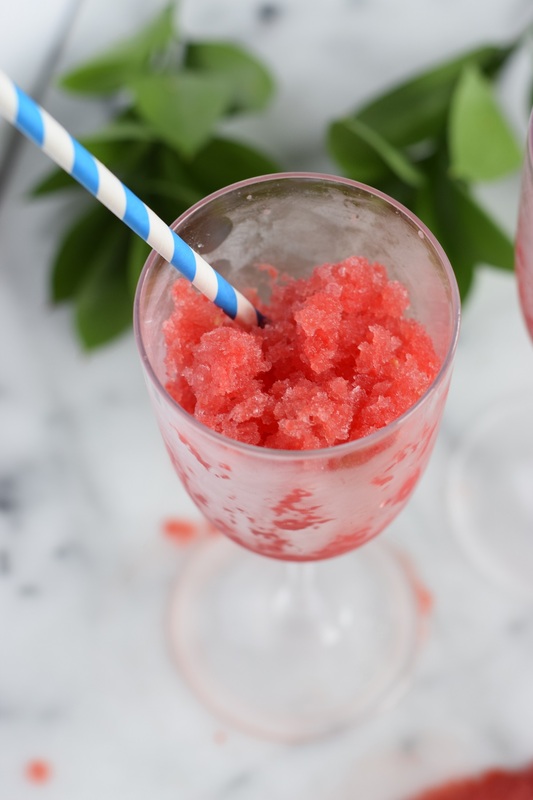 It’s time for a party, and it’s time for watermelon rosé snow cones! Something about mixing booze into a childhood staple has adults all in an excited flurry. Jello shots, vodka soaked gummies, frosé – I think it’s because we feel like we’re breaking the rules. That was always the goal of being a kid, but now we’re adults and we can do whatever we want! YEAH! 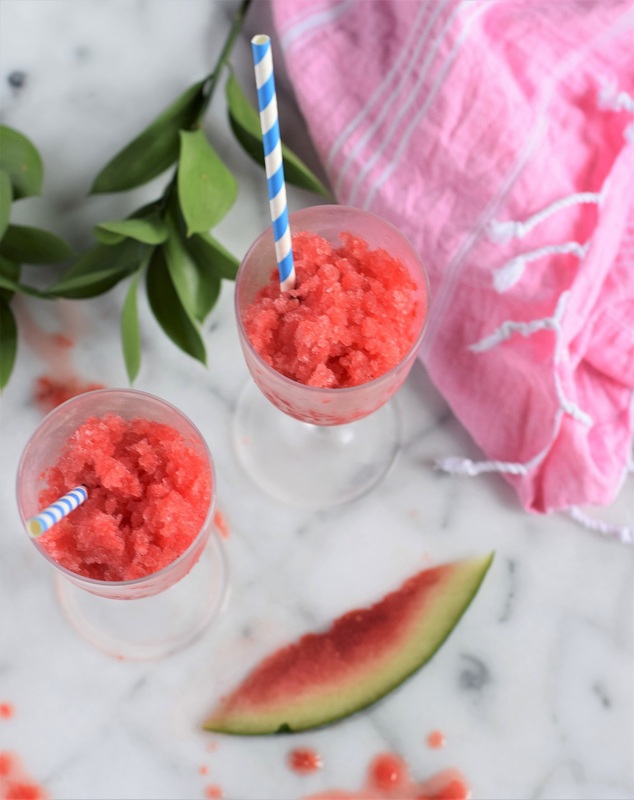 Either way, I’m on board, and these watermelon rosé snow cones fit the bill for breaking the rules and being totally perfect for the fourth. Step 1, scoop fruit out of half of a watermelon and blend to a liquid. Step 2, stir in rosé wine. Step 3, freeze overnight. 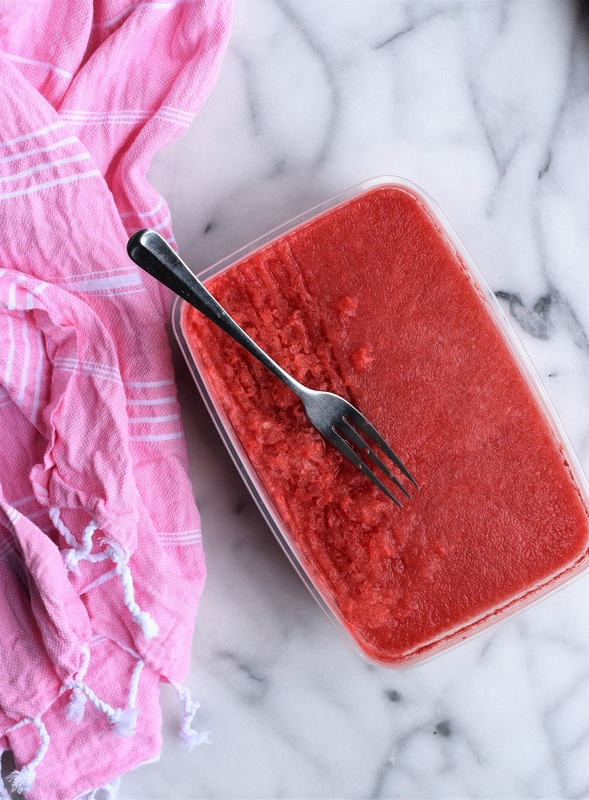 Step 4, throw your container into your PackIt cooler, scrape it with a fork, and be ready to be the life of the party with the best snow cones ever! 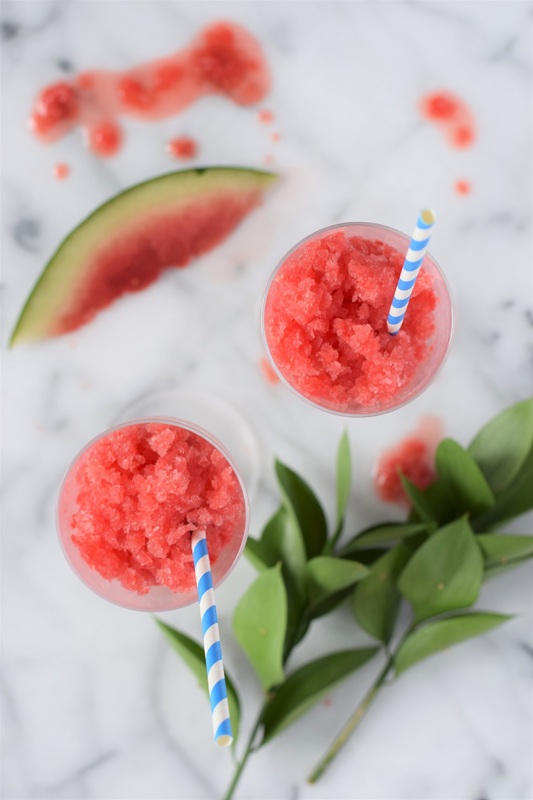 The texture of the watermelon and the rosé after it has been frozen together and then scraped is just like an icy, crunchy snow cone! 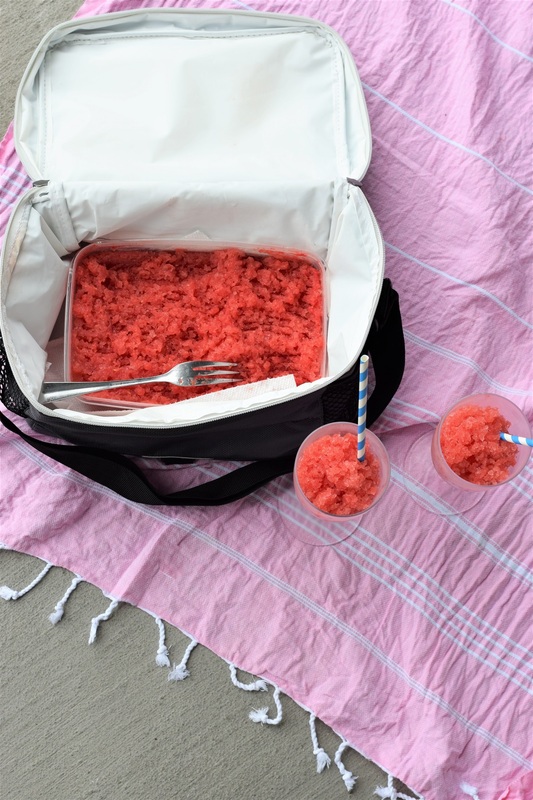 You can transport and serve the snow cones right out of the cooler to keep it cool for hours so that guests can just serve themselves, or you can even bring it to a picnic on the go. I have to say that I’ve tried my fair share of coolers, and most of them are fine. You open it up, pour a ton of ice into them, and then try to fit your goodies inside. They keep things cold, but they are messy (melted ice everywhere, possibly messing up your food), take up a lot of space, and can be so heavy since you have to fill them with ice. I’m now 100% sold on PackIt coolers. They have an entire collection of foldable, freezable coolers in tons of shapes and sizes. 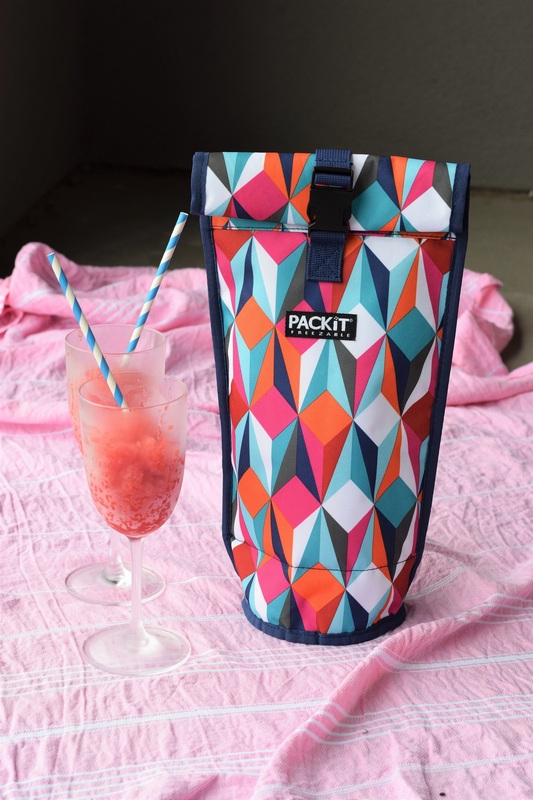 Once you are ready to head out on a trip to the beach or are planning a picnic at the park, you just take your PackIt cooler out of the freezer, fill it with your favorite goodies, and go! Even on a hot Houston day, these coolers will keep your food and drinks nice and chilled for hours without having the mess of melting ice or the bulkiness of a hard sided cooler. When you’re done, just fold it up and head home. 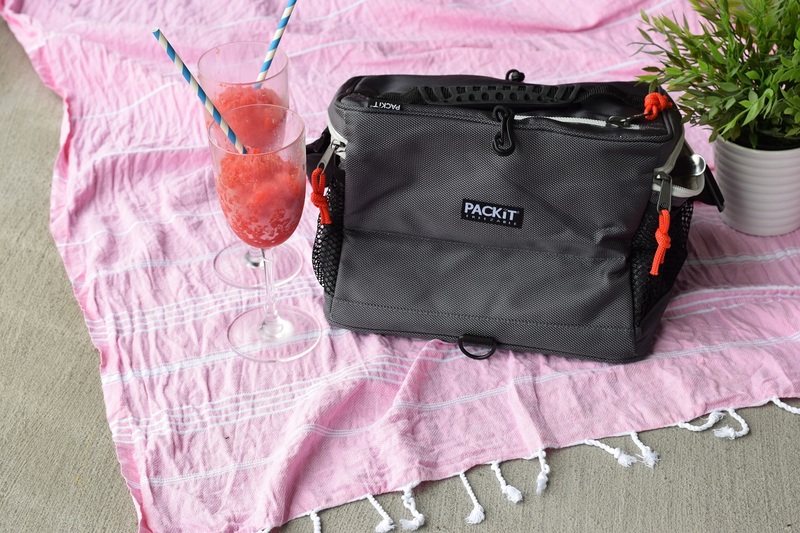 I am totally excited to bring my PackIt coolers along with me on my trip to Hawaii so that we have a way to bring cold picnics to the beach! And I love them so much, that I am giving away a set of coolers (one 18-can cooler and one wine cooler) to one lucky reader! This giveaway is closed. The winner of the giveaway is @rusthawk1 from Instagram! Thanks to everyone who entered! 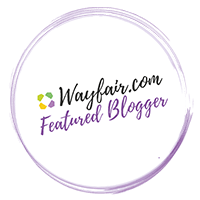 Thank you to PackIt for sponsoring this blog post. All recipes and opinions about the products are honest and completely my own! 1. Cut your watermelon in half and then scoop out all of the fruit into a blender. Mix up the fruit and juices until smooth. Pour the watermelon juice into a container and add your rosé wine. Stir, seal the container, and place into the freezer overnight. 2. When ready to serve, take the container out of the freezer and let it sit for about 10 minutes. Place it into your pre-chilled PackIt cooler (the 18-beer can cooler is the perfect size), and use a fork to scrape away at the surface of the mixture to break it into small ice chunks. Scoop your snow cone mixture into plastic wine glasses or little cones to serve. 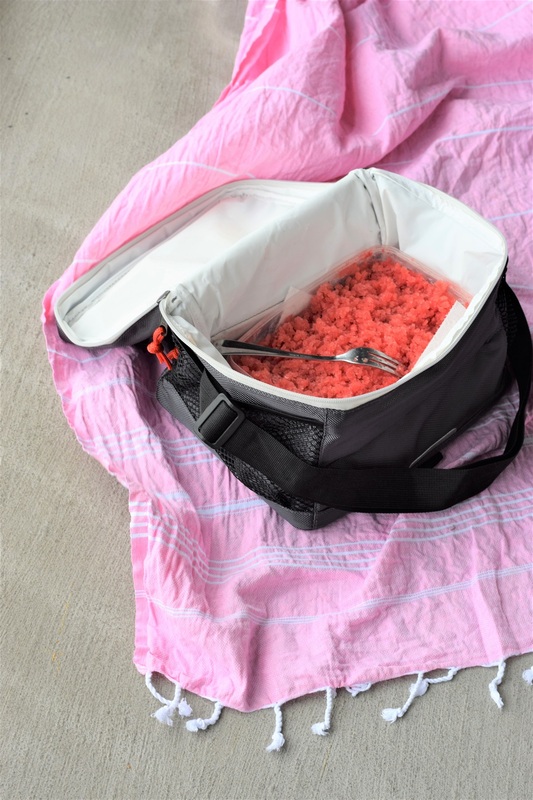 Keep the cooler zipped when not serving to keep the snow cones cold as long as possible. OMG sounds amazing!! Thanks for entering! That is so true! Thanks for entering, Janet! I love angel food cake with a berry compote. So delicious in the summer, and I feel somewhat healthy. Yum!! That sounds amazing right now haha. Thanks for entering! Sherbet watermelon! Not to be confused with watermelon sherbet.